The present study was carried out to prepare multi-herbal combination via comparing antioxidant activity and polyphenolic composition of five medicinal plant extracts of Punica granatum L., Putranjiva roxburghii Wall., Swertia chirata Buch.-Ham., Tinospora cordifolia (Willd.) Miers and Trigonella corniculata L.
The herbs were individually evaluated using in vitro antioxidant assays and analyzed by HPLC-PDA. The resultant data was examined using principal component analysis (PCA). Further, herbal combination was prepared on the basis of PCA. The PCA divided the plants into three groups. The leading or primary group contained P. granatum and P. roxburghii with the highest antioxidant activity strongly correlated with high amount of kaempferol. S. chirata was acknowledged as nourisher herb in one and T. cordifolia and T. corniculata were identified as stimulator herbs in other group. The herbal combination exhibited high antioxidant activity as compared to the individual plants. The combination revealed good antiproliferative efficacy against hepatocellular carcinoma (HepG2) cells with IC50 of 75.864 μg/ml. The activity observed in vitro with HepG2 cells suggests that the herbal combination can provide therapeutic activity in vivo in future. The study may provide information regarding precise preparation of multi-herbal formulations using PCA as a tool in pharmaceutical industries. Phytotherapeutic management of pathological conditions encompasses combinatorial intervention of multiple bioactive constituents manifesting multi-target strategy . The polyphenols from these strategies represent an important diverse cluster of phytochemicals primarily contributing to the remedial measures and prevention of many diseases. These phytoconstituents are usually hydrophobic in nature and their hydrophobicity is intermediate between vitamin C (highly hydrophilic) and vitamin E (highly hydrophobic) . Therefore, their extraction primarily includes solvents like acetonitrile, methanol, acetone and ethanol or their non-aqueous and aqueous admixtures. Thus, contemporary research has been mainly driven towards the use of these solvents neglecting their adverse impact on environment and biology . In addition, the removal of solvent residues requires additional laborious purification steps. There is a major concern regarding the delivery of the effective dose of these polyphenols to target organs due to their lower absorptive tendency in colon . The bioavailability of most of these constituents depends on their water solubility and metabolism in body. The clinical success of these components as a drug has been a limiting factor due to their poor solubility in water, fast metabolic rate or both . Hence, naturally developed water based multi-herbal formulations may circumvent the shortcomings of poor bioavailability without compromising their medicinal value. Water at elevated temperature under pressure is comparable to organic solvent extraction . The elevated temperature reduces the dielectric constant of water making it competent to dissolve even hydrophobic organics such as polycyclic aromatic hydrocarbons and polychlorinated biphenyl analogs. However, the role of pressure is to maintain the liquid state of aqueous mixture and has no significant effect on the dielectric constant of water . In addition very few studies have focussed on cancer preventive or therapeutic agents extracted with water from the plants. In this report we have examined the activity of aqueous extracts of several selected herbs both alone as well as in combination. The selection of plants considered in this treatise is based on their traditional uses and commercial significance. Five aqueous herbal extracts from Punica granatum L., Putranjiva roxburghii Wall., Swertia chirata Buch.-Ham., Tinospora cordifolia (Willd.) Miers and Trigonella corniculata L. were used in the present study. A comparative investigation was carried out to portray the antioxidant prospective of water extracts of these five plants belonging to different families. In order to get a more extensive depiction, we examined the antioxidant capacities and polyphenolic composition(s) of different eco-solvent extracted medicinal plant extracts supported by the HPLC-PDA analysis. To the best of our knowledge there is a no report describing specific way for the preparation of multi-herbal formulations. The properties of different herbs in multi-herbal formulations encompass three vital points. First is to identify the primary herb(s), second is the recognition of nourisher herb(s) and third is categorizing active stimulator herb(s). Subsequently, in order to systematically generate multi-herbal combination, the multidimensional variables (antioxidant activities and componential profiles) were statistically evaluated. 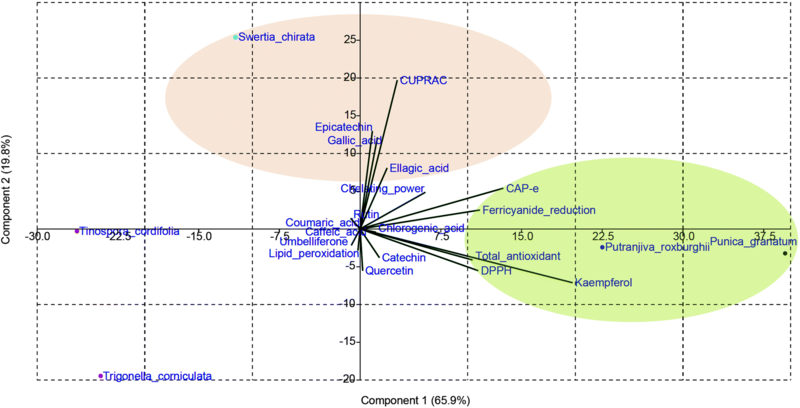 We performed principal component analysis (PCA) to compare the antioxidative capability of five medicinal plants. The newly identified herbal combination was further evaluated for antiproliferative activity against human malignant cancer cell lines. Thus, the study highlights relevant comprehension with respect to the selection of perceptive combination of herbal plants, for preparing multi-herbal formulations using PCA and reducing the laborious efforts of ‘hit and miss’ methods in pharmaceutical industries. DPPH (2–2’diphenyl-1-picrylhydrazyl), gallic acid, catechin, chlorogenic acid, epicatechin, caffeic acid, umbelliferone, coumaric acid, rutin, ellagic acid, quercetin, and kaempferol with ≥90% purity were acquired from Sigma-Aldrich, Bangalore (India). HPLC grade methanol and water were used for HPLC analysis. All other reagents and chemicals used in the present investigation were of analytical grade. The preferred plant parts were from different families (Table 1). The well-authenticated and validated dried samples of Punica granatum L. (peel), Swertia chirata Buch.-Ham. (whole herb), Tinospora cordifolia (Willd.) Miers (stem) and Trigonella corniculata L. (seeds) were procured from Herbal Health Research Consortium (HHRC) Pvt. Ltd. Amritsar (India), a reputed government approved Ayurvedic, Siddha and Unani Drug Testing Laboratory. The leaves of Putranjiva roxburghii Wall. were collected from the Botanical Garden, Guru Nanak Dev University, Amritsar (India). Plant samples of P. granatum, P. roxburghii, S. chirata, T. cordifolia and T. corniculata were authenticated and verified by Mr. Viney (Research Officer), Herbal Health Research Consortium (HHRC) Pvt. Ltd. Amritsar (India) by observing the characteristic anatomical features with pharmacognostic studies. All samples were deposited in the herbarium of HHRC Pvt. Ltd. Amritsar (India) with voucher numbers ANC-04, PUT-02, CRT-09, GIL-46 and MET-10 respectively. The disintegrated samples (100 g each) were soaked separately in stainless steel vessels containing potable water for overnight in the ratio 1:16 (w/v) at room temperature under aseptic conditions. Then the samples were heated at boiling temperature on a mild flame to reduce it to one quarter of original volume [7, 8]. The decoctions were allowed to cool and filtered using five layered muslin cloth followed by Whatman filter sheet no. 1. Whereas, for herbal combination, the disintegrated samples (in calculated proportion of 33, 27, 25, 10 and 5% for P. granatum, P. roxburghii, S. chirata, T. cordifolia and T. corniculata respectively) were soaked together and decoction was prepared as described above for individual plants. Principal component analysis was employed for the calculation of percentage proportion of plants used in the preparation of multi-herbal combination as explained later in the results section. The filtered decoctions were then evaporated to dryness on water bath and extracts were stored at 4 °C till further use. The methodology proposed by Gul et al. was followed for determining the propensity of herbal extracts to reduce molybdate ions. The decocted extracts of each plant (1000 μg/ml) were added to the reagent mixture consisting sulphuric acid (0.6 M), sodium phosphate (28 mM) and ammonium molybdate (4 mM). The incubation of the reaction mixture was carried out at 95 °C for 90 min. After cooling at room temperature, the absorbance was measured at 695 nm using ELISA microplate reader (Synergy HT, BioTek). The ascorbic acid was selected to obtain a standard curve with a regression equation y = 0.002x-0.050 and total antioxidant potential was expressed in terms of ascorbic acid equivalents (AAE). The scavenging activity of herbal extracts was investigated by following the procedure reported by Kang et al. using 2–2’diphenyl-1-picrylhydrazyl (DPPH) radicals as substrate. The different concentrations of extracts were added to DPPH solution (0.1 mM) and incubated for 30 min. The decrease in the absorbance was monitored at 517 nm using ELISA microplate reader (Synergy HT, BioTek). Gallic acid was employed as a positive reference. The scavenging of 2–2’diphenyl-1-picrylhydrazyl radicals by different extracts was expressed as percentage inhibition using Eq 1. The reduction potential of different extracts to reduce ferricyanide ions to ferrocyanide ions was interpreted by the method described by Kalyana Sundaram et al. . The assay mixture contained different concentrations of extracts with phosphate buffer (200 mM, pH 6.6) and potassium ferricyanide (1%). This reaction mixture was kept for 20 min at 50 °C after which trichloroacetic acid (10%) was added to the mixture and centrifugation was carried out at 3000 rpm for 10 min. The supernatant thus obtained was mixed with distilled water and ferric chloride (0.1%) and color developed was measured at 700 nm using ELISA microplate reader (Synergy HT, BioTek). The comparison of the results was done using gallic acid as a positive control with a regression equation y = 16.6ln(x)-15.7. The percentage reduction was calculated using the Eq 2. The defensive effect of decocted extracts was analyzed according to the methodology given by Kumar and Pandey with slight modifications . The different concentrations of extracts were mixed with KCl (0.15 M) and egg yolk homogenate (10% w/v). Ferric chloride (10 mM) was used to initiate the peroxidation following incubation at 37 °C for 30 min. Formation of thiobarbituric acid reactive substances (TBARS) indicates extent of lipid peroxidation. Therefore, the estimation of TBARS was carried out by addition of ice-cold HCl (0.25 N) containing trichloroacetic acid (15%), thiobarbituric acid (0.5%) and butylated hydroxytoluene (0.5%) to the assay mixture. The mixture was then heated at 100 °C for 60 min. After cooling and centrifugation, absorbance of the supernatants was read at 532 nm using ELISA microplate reader (Synergy HT, BioTek). The antioxidant activity was evaluated in percentage by using Eq 1. 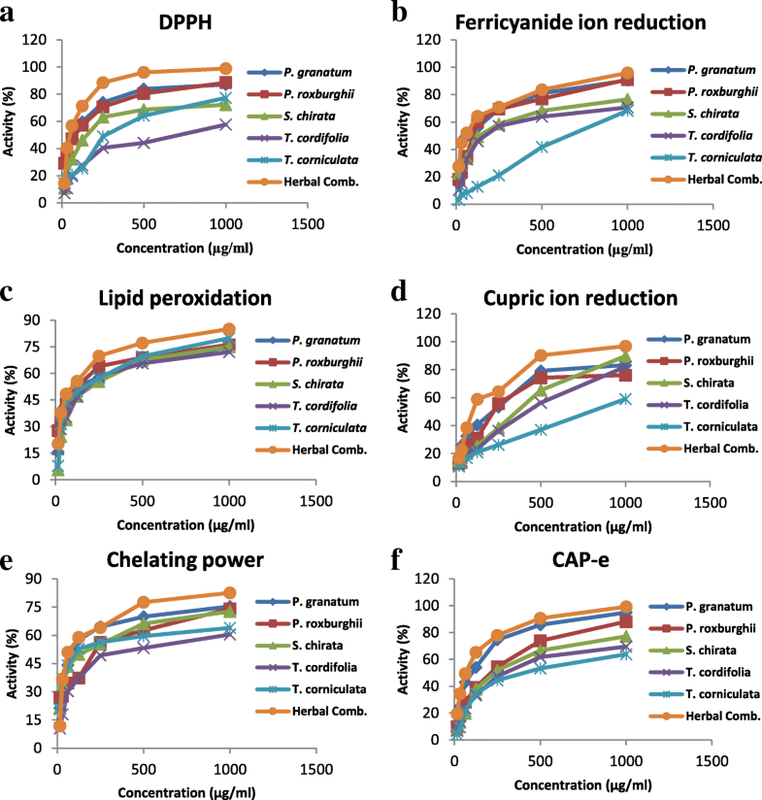 The cupric ion reducing antioxidant capacity (CUPRAC) method given by Apak et al. was performed. The reaction mixture consisted of copper (II) chloride (10 mM), neocuproine (7.5 mM) and ammonium acetate buffer (1.0 M) with different concentrations of extracts followed by addition of distilled water. The reaction mixture was kept at room temperature for 30 min and ELISA microplate reader (Synergy HT, BioTek) was used to measure the absorbance at 450 nm. Gallic acid was used as a reference to draw the standard curve with regression equation y = 20.3ln(x)-31.1 and antioxidant activity was calculated using Eq 2. The chelating potential of herbal extracts for ferrous ions was assessed by slightly modifying the method given by Navanesan et al. . The different concentrations of extracts prepared in distilled water were mixed with ferrous chloride (2 mM) and the reaction was initiated by the addition of ferrozine (5 mM). The mixture was incubated at room temperature (25 ± 2 °C) for 10 min and the absorbance was observed at 562 nm using ELISA microplate reader (Synergy HT, BioTek). The decrease in the absorbance of herbal extracts was considered as the measure of chelation power. The chelation potential of EDTA (ethylenediaminetetraacetic acid) was also monitored for comparison and the activity was calculated by means of Eq 1. CAP-e assay was used to evaluate the antioxidant capacity of five plant parts and prepared herbal combination as per the method described by Honzel et al. . This cellular assay utilizes red blood cells as a model to evaluate the protection afforded by antioxidant. In this procedure, whole blood (B+) was collected from healthy donors. The plasma, peripheral blood mononuclear cells, and polymorphonuclear cells were removed and the remaining packed red blood cell (RBC) fraction was washed three times in 10–14 ml phosphate buffered saline (PBS) by centrifugation at 2400 rpm for 10 min. After the completion of third washing, the supernatant was removed and 200 μl packed red blood cells were pipetted into 10 ml PBS. The red blood cell aliquots were stored at 4–8 °C until use. Then, concentrations of the extract and the standard gallic acid were prepared and pre-incubated with 100 μl of the RBC suspension for 20 min at room temperature in the dark. This step was followed by three times washing of red blood cells with PBS by centrifugation for 2 min at 2400 rpm to remove any unabsorbed antioxidants. 70 μl of the red blood cells were transferred to a black microplate and 50 μl of 2′-7′dichlorofluorescein diacetate (DCF-DA) was added to each well. The stock solution of fluorescent probe was prepared by mixing 50 μg DCF-DA in 0.2 ml dimethyl sulfoxide and working solution was prepared by adding 0.01 ml of stock to 10 ml of PBS. The microplate was incubated for 20 min and thereafter, red blood cells were exposed to 50 μl H2O2 (167 mM) for 45 min to induce oxidative stress. Then, the fluorescence intensity was recorded with excitation at 485 nm and emission at 535 nm. The red blood cells were taken as negative control while red blood cells exposed to an oxidative challenge were considered as positive controls. Total phenolic content of individual plant extract and combination was estimated following the protocol reported by Gupta and Gupta . It consisted of mixing an aliquot of each extract with 1 N Folin-Ciocalteu reagent and 20% sodium carbonate. This mixture was incubated for 2 h and then absorbance was measured at 765 nm. Gallic acid was used as the positive control and the amount of total phenolic content was calculated using regression equation of gallic acid given by y = 0.00181x with a correlation coefficient, r = 0.9999. The concentration of phenolic compounds in herbal extracts was expressed as mg gallic acid equivalents (GAE)/100 mg dry weight of extract. Total flavonoid content of each herbal extract was measured adopting the methodology described by Chanthasri et al. . Briefly, an aliquot of extract was thoroughly combined with distilled water, 5% sodium nitrite and 10% aluminium trichloride solution. After incubation of reaction mixture for 5 min at ambient temperature, 1 M sodium hydroxide was added. The mixture was vortexed and absorbance was recorded at 510 nm using ELISA microplate reader (Synergy HT, BioTek). The total flavonoid content was calculated from the regression equation y = 0.00039x (r = 0.9997) obtained by plotting calibration curve of standard catechin and expressed as mg catechin equivalents (CE)/100 mg dry weight of extract. Standard stock solutions of gallic acid, catechin, epicatechin and rutin were prepared separately at 8 mg/ml (8000 ppm) concentration in HPLC grade methanol. Simultaneously, stock solutions of chlorogenic acid, caffeic acid, umbelliferone, coumaric acid, ellagic acid, quercetin and kaempferol were prepared separately at 4 mg/ml concentration in HPLC grade methanol. Subsequently, each standard solution was mixed in equal proportion to obtain standard mix solution. Furthermore, standard mix solution was 2-fold serially diluted using HPLC grade methanol. The plant extracts were also prepared by dissolving 1 mg of each plant extract in 1 ml of HPLC grade methanol. The analysis was performed on Nexera UHPLC (Shimadzu, Kyoto, Japan). The chromatographic separation and detection was completed using Enable C-18 G (150 × 4.6 mm, 5 μm particle size) column at 25 °C and photo diode array (PDA) detector at 280 nm detection wavelength. The low pressure gradient elution system, using mobile phase, 0.1% acetic acid in water (A) and methanol (B), was used for the separation of peaks with flow rate of 1 ml/min and the 5 μl injection volume. The gradient consists of 70% A and 30% B at start, reaching 45% B at 12 min, up to 75% B at 13.5 min, maintaining 75% B until 15 min, then 50% B at 16.6 min, up to 25% B at 18 min, upholding 25% B until 20 min and re-equilibration of 30% B at 21 min until stopped at 22 min with elution of 4 min. The mixture of standards for calibration curve was prepared by diluting the stock solution with methanol at 7 concentrations achieved by successive 2-fold serial dilution for quantitative analysis. The calibration curves were constructed by plotting the peak areas versus the concentration of each analyte. The method selectivity was performed by analysis of standard compounds and samples. The peaks of gallic acid, catechin, epicatechin, chlorogenic acid, caffeic acid, umbelliferone, coumaric acid, ellagic acid, rutin, quercetin and kaempferol were identified by comparing their retention times and spectrum with those of the standard peak and spectra. The aliquots of the standard solutions (diluted with methanol) were injected at various concentrations. The detection and quantification limit for all the detected standard analytes were calculated on the basis of signal-to-noise ratio (S/N) of 3 and 10. The precision and accuracy of the HPLC method was evaluated for three days separately for intraday and collectively for interday with nine replicates each day. The precision was expressed as percentage relative standard deviation (RSD) and accuracy was calculated as the percentage of recovered amount of polyphenols weighed against standard concentration. The growth inhibition efficacy of the prepared herbal combination was scrutinized by resazurin cell viability assay following the methodology proposed by Riss et al. . Five human cancer derived cell lines (MG-63, A-549, HeLa, HepG2 and IMR-32) and a non-malignant 293 T cell line were acquired from National Centre for Cell Science (NCCS), Pune (India) (Table 2). The cells were maintained in DMEM or RPMI-1640 growth medium and cells were harvested upon attaining 80–90% confluency followed by centrifugation for 5 min at 1000 rpm at 2–5 °C. The resultant cell pellet was resuspended in complete growth medium to get 1–2 × 105 cells/ml via counting with hemocytometer. The cell suspension (100 μl) was seeded in each well of 96-well tissue culture plate followed by incubation for 24 h in CO2 incubator at 37 °C, 5% CO2 with 90% relative humidity. The cells attached to the wells were treated with the concentrations of herbal combination ranging from 31.25 to 1000 μg/ml. After 24 h, 20 μl of deep blue colored resazurin solution (freshly prepared) was added to each microplate well and further incubated for 4 h. Then, the fluorescence was recorded at excitation/emission wavelength of 560/590 nm employing ELISA plate reader (Synergy HT, BioTek). Camptothecin (10 μM) was employed as a positive standard and the wells containing medium were considered as negative control in the experiment. For morphological changes in treated and untreated cells, phase contrast microscopy was used. Confocal microscopy was used according to the methodology given by Alam et al. with slight modifications for determination of nuclear changes. HepG2 cells were seeded in a 6 well plate at a concentration of 5 × 105 cells per well for 24 h. Thereafter, the HepG2 cells were treated with IC50 of herbal combination and the positive control, camptothecin. Following incubation for 24 h, the cells were washed thrice with phosphate buffered saline (0.1 M) and fixed with paraformaldehye (4%) for 30 min. Finally, the slides were prepared after staining the cells with 4′,6-diamidino-2-phenylindole (DAPI) (10 μg/ml) and Nikon A1R laser scanning confocal microscope system (Nikon Corp., Japan) fitted with Nikon 40X 0.95 NAD-ICM/N2 plan objectives was used to capture images. The acquisition of images and analysis was carried out using the built-in Nikon NIS Element AR software and the fluorescence was observed with a long-pass 488 emission filter. The protocol of Shin et al. was utilized to examine the generation of reactive oxygen species employing HepG2 cell line. These cells were seeded at the density of 3 × 105 cells/well in 1 ml/well growth medium in 24-well tissue culture plate. After 24 h, the cells were treated with IC50 concentration of the herbal combination. The treated cells were stained with 10 μg/ml of 2′-7′dichlorofluorescein diacetate (DCF-DA). Then, fluorescence was measured using ELISA plate reader (Synergy HT, BioTek) with excitation and emission wavelengths of 485/20 and 528/20 nm respectively. The assessment of alterations in membrane integrity of HepG2 cells was determined using the procedure described by Deng et al. . Following the overnight culture of HepG2 cells (3 × 105 cells/well in 1 ml/well growth medium in 24-well culture plate), the cells were treated with IC50 concentration of herbal combination. This treatment was followed by addition of rhodamine 123 dye (10 μg/ml) for an hour. Cells were then washed three times with phosphate buffered saline and the fluorescence was examined using ELISA plate reader (Synergy HT, BioTek) with excitation of 485/20 nm and emission of 528/20 nm. Data were expressed as mean ± standard error (SE) of three replicate determinations. One way analysis of variance (ANOVA) was used to determine the differences among the means and p values ≤0.05 were considered as significant. Principal Component Analysis (PCA) was applied on the HPLC and antioxidant resultant variables. Paleontological Statistics (PAST) software version 3.15 was used for data analysis . The ability of decocted extracts to reduce molybdate ions was analyzed by the appearance of green colored complex. The increase in the absorbance of ascorbic acid with the concentration was noted and the regression equation y = 0.002x-0.050 with R2 = 0.996 was obtained to interpret the antioxidant capacity of different plant extracts. In view of these results, P. roxburghii leaves exhibited the highest potential to reduce the molybdate ions (391.750 ± 0.022 μg AAE/mg of dry extract) followed by peel of P. granatum, S. chirata whole herb, T. cordifolia stem and T. corniculata seeds with reduction potential of 372.875 ± 0.013, 184.250 ± 0.010, 155.375 ± 0.015 and 143.375 ± 0.015 μg AAE/mg of dry extract respectively. The order of the molybdate ion reduction capability of different herbal samples was: P. roxburghii > P. granatum > S. chirata > T. cordifolia > T. corniculata. Further, the herbal combination represented even high propensity to reduce the molybdate ions exhibiting total antioxidant capacity of 445.25 μg AAE/mg of dry extract. The inhibitory action of all the five extracts against 2–2’diphenyl-1-picrylhydrazyl radicals is illustrated in Fig. 1a. The plant extracts exhibited concentration dependent loss of violet color with elevation in percentage scavenging of DPPH radicals. P. granatum peel extract recorded the lowest IC50 with 64.199 μg/ml concentration indicating good radical scavenging action whereas T. cordifolia stem extract showed the least scavenging property among five extracts with highest IC50 of 651.780 μg/ml. The order of ranking based on IC50 values with respect to scavenging of DPPH radicals was: P. granatum < P. roxburghii < S. chirata < T. corniculata < T. cordifolia. As compared to the antioxidant ability of individual plant extracts, the herbal combination presented 98.88% reduction of DPPH radicals at the highest tested concentration (1000 μg/ml) with the lowest IC50 of 55.433 μg/ml. Additional file 1: Table S1. The reducing power of plant extracts signifying breakage of free radical chain was analyzed by their reduction ability to reduce ferricyanide ions to ferrocyanide ions (Fig. 1b). P. granatum peel extract demonstrated the lowest 50% inhibitory concentration of 63.432 μg/ml in comparison to P. roxburghii, S. chirata, T. cordifolia, T. corniculata. The lowest IC50 of P. granatum highlighted it to be the better reductant of ferricyanide ions among five extracts and T. corniculata was emerged to possess least reduction potential. Considering the IC50 values, the ranking order was: P. granatum < P. roxburghii < S. chirata < T. cordifolia < T. corniculata. In case of combination prepared by mixing these five ingredients, the minimum 50% inhibitory concentration of 55.271 μg/ml was recorded with the highest percentage reduction i.e. 95.84% at 1000 μg/ml concentration. Additional file 1: Table S2. The protection contributed by the plant extracts against oxidative deterioration was explored by inactivation of free radical chain reaction. The concentration dependent percentage of peroxyl radicals scavenged by each plant extract has been shown in Fig. 1c. The IC50 of 102.749 μg/ml featured P. roxburghii leaves extract to be a promising scavenger of peroxyl radicals as compared to P. granatum, T. cordifolia and T. corniculata. S. chirata whole herb extract showed the least effectiveness against peroxyl radicals with 50% inhibitory concentration of 179.124 μg/ml. According to the IC50 values displayed by the extracts, the extracts were arranged as: P. roxburghii < P. granatum < T. corniculata < T. cordifolia < S. chirata. It was elucidated that the combination presented the lowest IC50 of 82.271 μg/ml, indicating it as the most active scavenger of peroxyl radicals. Additional file 1: Table S3. The investigation of protective action of extracts was carried out by observing the reduction of cupric ions. As mentioned in Fig. 1d, IC50 of 150.551 μg/ml represented the appreciable efficacy of P. grantum to reduce the cupric ions and T. corniculata seed extract was reported to have the lowest percentage reduction with highest IC50 (802.174 μg/ml). The ability to reduce cupric ions by five plants was found to be in order as: P. granatum > P. roxburghii > T. cordifolia > S. chirata > T. corniculata. Whereas, the herbal combination presented the best antioxidant activity as revealed by its lowest IC50 of 96.356 μg/ml. Additional file 1: Table S4. The increase in percentage chelation of ferrous ions by the five different plant extracts was observed to be proportional to the concentration and is illustrated in Fig. 1e. The lowest IC50 of 101.341 μg/ml by P. granatum among all plant extracts elucidated its potent chelating power ability against ferrous ions. T. cordifolia was revealed to hold the least chelation efficacy with IC50 of 361.265 μg/ml. The chelating power ability of five plants was found to be in order as: P. granatum > S. chirata > T. corniculata > P. roxburghii > T. cordifolia. Further, the herbal combination indicated the lowest IC50 of 93.143 μg/ml presenting it to be the most active chelator of ferrous ions in comparison to single species. Additional file 1: Table S5. The propensity of plant extracts and herbal combination to inhibit the oxidative damage within the erythrocytes was analyzed and the results are presented in Fig. 1f. P. granatum peel extract demonstrated the lowest 50% inhibitory concentration of 95.559 μg/ml in comparison to P. roxburghii (167.304 μg/ml), S. chirata (230.324 μg/ml), T. cordifolia (293.281 μg/ml) and T. corniculata (392.253 μg/ml). The lowest IC50 of P. granatum indicated its high capability in protecting the cells from oxidative damage and the highest IC50 value of T. corniculata pointed towards its least inhibitory potential against oxidative stress. Considering the IC50 values, the ranking order was: P. granatum < P. roxburghii < S. chirata < T. cordifolia < T. corniculata. In case of combination, the minimum 50% inhibitory concentration of 66.754 μg/ml was recorded with the highest percentage inhibition of 99.18% at 1000 μg/ml. Additional file 1: Table S6. Collectively the results shown in Fig. 1 indicate that the combination of herbs provide increased antioxidant activity as compared to individual plants in all assays. As shown in Table 3, P. granatum contained 72.9 mg GAE/100 mg dry weight of extract in phenolic content assay followed by S. chirata, P. roxburghii, T. cordifolia and T. corniculata in decreasing order respectively. Herbal combination showed the highest amount of phenolic content with 86.8 mg GAE/100 mg dry weight of extract. The flavonoid content was 66.4 mg CE/100 mg dry weight of extract in P. granatum followed by P. roxburghii, S. chirata, T. corniculata and T. cordifolia in descending order respectively. The flavonoid content was highest in the herbal combination with amount of 78.9 mg CE/100 mg dry weight of extract. The chromatographic method developed and used in this study has been found to be sensitive and accurate as observed by low detection and quantitative limits with high linearity (Table 4). The intraday and interday precision and accuracy of method showed good reproducibility and repeatability as shown in Table 5. The method was analytically precise in simultaneous detection and quantification of 11 polyphenols. Additional file 2: Figures S1–S6. The assessment of the eleven polyphenols viz., gallic acid, catechin, chlorogenic acid, epicatechin, caffeic acid, umbelliferone, coumaric acid, rutin, ellagic acid, quercetin and kaempferol with good resolution was conducted to strengthen the results obtained in in vitro antioxidant analysis. Among five plant extracts, P. granatum was observed to contain maximum amount (79.75 μg/mg) of total polyphenols followed by P. roxburghii as shown in Table 6. The highest composition of 44.16 μg/mg of kaempferol was detected in P. granatum peel extract. The maximum content of kaempferol (22.78 μg/mg), ellagic acid (19.22 μg/mg), gallic acid (1.46 μg/mg), quercetin (8.34 μg/mg) was noted in P. roxburghii, S. chirata, T. cordifolia and T. corniculata respectively. Based on the chromatograms, the herbal samples were ranked in accordance to their polyphenolic amount as: P. granatum > P. roxburghii > S. chirata > T. corniculata > T. cordifolia. Principal component analysis (PCA) was performed on the multidimensional variables of five plants. The PCA reduced the variables into two main principal components with component 1 and 2 explaining 65.9 and 19.8% variability respectively (Fig. 2). Total of 85.7% variability was explained by both component 1 (PC1) and component 2 (PC2), with PC1 being the prominent one. PC1 was positively associated with almost all variables except rutin, umbelliferone and caffeic acid. It was found that PC1 has no association with lipid peroxidation assay. Overall, PC1 explained high variability through kaempferol, DPPH, ferricyanide ion reduction, total antioxidant and CAP-e assay. Whereas, PC2 was found to be positively associated with ferricyanide ion reduction assay, CUPRAC, chelating power assay, gallic acid, epicatechin, coumaric acid, rutin and ellagic acid. The highest variability of PC2 can be explained by CUPRAC, gallic acid, epicatechin and ellagic acid. On the basis of PC scores, the herbal combination was prepared in proportion of 33, 27, 25, 10 and 5% for P. granatum, P. roxburghii, S. chirata, T. cordifolia and T. corniculata respectively. Further, this combination was evaluated for its antiproliferative activity against different human cell lines as follows. The growth inhibitory effect of herbal combination was carried out using different malignant cells viz. MG-63, IMR-32, HeLa, HepG2 and A-549. The growth inhibitory ability of combination was also evaluated on the non-malignant 293 T (embryonic kidney) cells and results were compared with malignant cells as shown in Table 7. The herbal combination was screened against a panel of human derived cell lines of different histological origin by reduction of resazurin as a fluorometric marker for the estimation of cellular viability. The effectiveness demonstrated by combination to inhibit the proliferation of different cancer cells based on IC50 values was: HepG2 > A-549 > IMR-32 > HeLa > MG-63. It was observed that among all malignant cells the combination significantly inhibited the proliferation of HepG2 cells with lowest IC50 of 75.864 μg/ml. The inhibitory effect of the combination was significantly prominent against HepG2 cells at each tested concentration as depicted in Fig. 3. Also, the combination was seen to be non-toxic towards non-malignant embryonic kidney (293 T) cells as it showed relatively high IC50 value of 9.32 × 109 μg/ml. The treated and untreated HepG2 cells were observed under phase contrast microscope to visualize morphological changes as shown in Fig. 4a-c. It was observed that the morphological characteristics of herbal combination treated HepG2 cells were considerably changed. Under phase contrast microscope, the treated cells demonstrated destruction of HepG2 monolayer with reduction in cell population. It also resulted in cell shrinkage, cell rounding and formation of apoptotic bodies. Subsequently, the changes in nuclear morphology were also observed under confocal microscope as shown in Fig. 5a-c. The confocal observations revealed substantial changes in HepG2 nuclei like fragmentation, shrinkage and formation of apoptotic bodies. The reactive oxygen species (ROS) stress has been observed to be higher in cancer cells as compared to normal cells. The low to moderate ROS levels may facilitate cancer cell proliferation, whereas higher ROS generation may induce cell death. The ROS generation facilitates depolarization of mitochondria and may induce apoptosis. The fluorescence value of 2′-7′dichlorofluorescein diacetate (DCF-DA) in the untreated HepG2 cells was considered as one and the relative fluorescence increase in treatment groups was then determined. 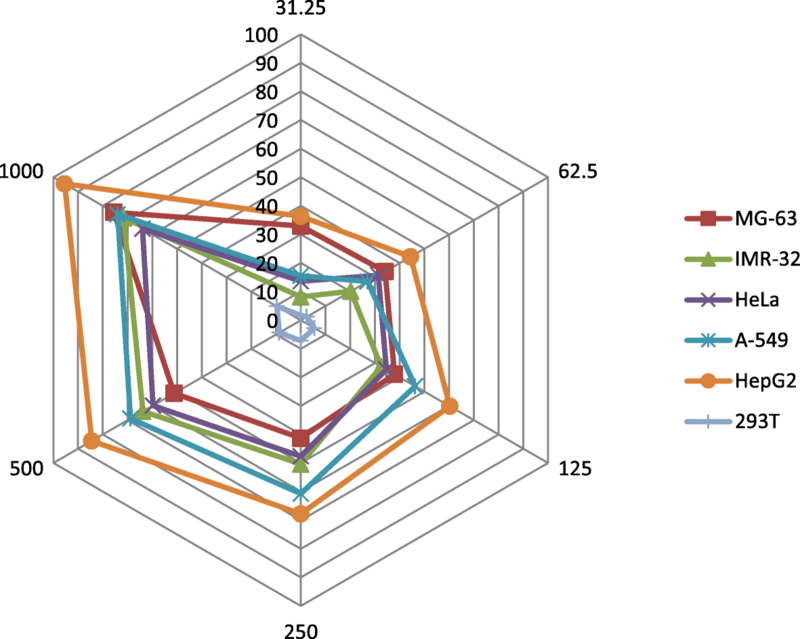 The IC50 treated HepG2 cells showed increase in the relative fluorescence by 1.45 fold, comparable to increase in the camptothecin (1.53 fold) treated cells, with respect to the untreated cells (Fig. 6). The increased generation of ROS in the treated HepG2 cells suggest apoptosis of hepatocellular carcinoma. The decrease in mitochondrial membrane potential (MMP) is a critical modulatory step in intrinsic pathway of cells undergoing apoptosis. The rhodamine intensity of control cells was selected as 100% indicating the significant activity of the untreated HepG2 cells and relative intensity in other treatment groups was then calculated. The IC50 treated HepG2 cells showed 12.5% decrease in rhodamine intensity, comparable to the camptothecin treated cells with 16.7% decrease in rhodamine intensity, with respect to the untreated cells. The experiment revealed probable apoptotic cell death of HepG2 cells owing to decrease in MMP leading to loss in mitochondrial integrity due to shift in transmembrane potential in hepatoma cells. Additional file 1: Table S7, Additional file 2: Figure S7. In recent years, considerable effort is diverted towards understanding the functional significance of the plant derived extracts and efficacious chemicals in clinical practice. The most active principles are present in the plant-based diet of humans and it has been viewed as a potentially suitable method for effective combating process against diseases, however, actual usefulness of this process is questionable due to very low amount of active agents in natural diet . Thus, natural combination of active principles in the form of herbal formulations may provide better means to deal with these problems. In the present communication, we employed water as a solvent for extraction purpose instead of other organic solvents which raise concerns for their applicability in humans. Moreover, very few studies reporting herbal efficacy in the literature have been conducted using aqueous extracts. In the present study, the comparative antioxidant efficacy and the polyphenolic composition of Punica granatum L., Putranjiva roxburghii Wall., Swertia chirata Buch.-Ham., Tinospora cordifolia (Willd.) Miers and Trigonella corniculata L. were assessed. The complete data set for antioxidant activity and HPLC-PDA quantification data of phenolic compounds were analyzed statistically with principal component analysis (PCA) for preparation of multi-herbal combination. The PCA divided the five medicinal plants into three groups, in which the first group consisting of P. granatum peel and P. roxburghii leaves explained the highest antioxidant activity strongly correlated with the presence of high amount of kaempferol. Structurally, the efficient radical scavenging ability of kaempferol appeared to be due to the enhanced planarity caused by the presence of 3-OH group on chroman ring . The first PCA group containing the fruit peel extract of P. granatum was found to be the most superior in ferricyanide ion reduction assay with IC50 value of 63.43 μg/ml closely followed by DPPH assay with 64.20 μg/ml IC50 value and CAP-e assay showed 95.56 μg/ml IC50 value among all antioxidant assays. However, at 1000 μg/ml concentration P. granatum displayed the highest antioxidant activity of 94.88% in CAP-e assay. The polyphenolic rich peel extract exerted strong antioxidative action, which might be attributed to its ability to donate hydrogen atom, enabling termination of free radical generation. Thus, indicating superior capability of this plant in other in vitro assays as well. The high reducing ability of P. granatum is analogous with the previous antioxidant studies on its fruit peel [25, 26]. In addition to antioxidant ability, the eco-friendly biological waste and nutraceutic resource i.e., peel of P. granatum has been depicted to possess numerous other therapeutic actions viz., anti-bacterial, anti-mutagenic, anti-neoplastic, anti-viral, anti-inflammatory, anti-hyperglycemic and hepatoprotective [27–31]. Furthermore, the second plant of the same PCA group i.e. the leaf extract of P. roxburghii also showed superiority in antioxidant activity for DPPH assay with 71.38 μg/ml IC50 value, among all antioxidant assays. With kaempferol being major active principle in it, the ability of leaf extract to scavenge DPPH radicals might be attributed to potentially strong hydrogen or electron donating capacity thus, preventing formation of reactive oxygen species. Along with the antioxidant activity, the leaf extract has been reported to possess strong analgesic, antipyretic and anti-inflammatory actions [32, 33]. Thus, PCA identified P. granatum peel and P. roxburghii leaves as the leading or primary herbs for the preparation of multi-herbal combination. The second PCA group consisted of only one plant, S. chirata Buch.-Ham. The antioxidant activity of this herbal extract was correlated with gallic acid, epicatechin and ellagic acid. Structurally, the antioxidant ability of gallic acid has been due to the vicinal presence of three OH functional groups on benzene ring . The radical scavenging ability of epicatechin might be due to vicinal substitution of hydroxyl groups on benzene ring (alike catechol moiety) or because of appearance of gallate esterified at OH group at position 3 in dihydropyran heterocycle ring . The ellagic acid has two orthodiphenolic functionalities, which maintain the total spin density delocalization, leading to more stability of 5-O• radical of compound enabling its high activity in antioxidant assays . The antioxidant activity of S. chirata whole plant extract has been found to be more prevalent in cupric ion reduction assay with 89.8% reduction potential at 1000 μg/ml concentration. However, the lowest IC50 value of 137.43 μg/ml was observed in chelating power assay closely followed by ferricyanide ion reduction assay with IC50 value of 143.42 μg/ml. Thus, suggesting strong chelating power and hydrogen donation ability indicating high antioxidant potential in other assays as well. Therefore, at the highest concentration of 1000 μg/ml, the extract has showed good antioxidant ability in cupric ion reduction assay. The traditional utilization of S. chirata displays wide array of therapeutic uses against ailments like anemia, fever, gastritis, bronchial asthma, malaria, hepatitis, constipation, liver ailments, dyspepsia, epilepsy, hypertension, scanty urine, melancholia, skin diseases, ulcers, worm’s infection, mental disorders and diabetes. It also helps in maintaining bile secretion and purifies blood . S. chirata is one of the crude raw materials for pharmaceutical industries which is used in multifarious marketed herbal preparations and is a MAP (medicinal and aromatic plant) crop . The whole plant of S. chirata possesses sky-scraping demand and has massive prospective in the marketplace for long tenure commercialization. S. chirata can be recognized as a nourisher in the multi-herbal combination due to its broad spectrum of pharmacological qualities. The third PCA group consists of T. corniculata L. and T. cordifolia (Willd.) Miers with lowest associated variables from antioxidant activity and polyphenolic compounds, thus positioned as outliers. Among all antioxidant assays, the highest detected activity of T. corniculata L. seed extract has been found to be more noticeable in lipid peroxidation assay with lowest IC50 value of 137.01 μg/ml closely followed by chelating power assay with IC50 value of 157.70 μg/ml. The high chelating activity for Fe2+ ions may be accountable for anti-lipid peroxidation ability of seed extract. Thus, the seed extract effectively averted the formation of peroxyl radicals, preventing oxidative stress. In accordance with present study, the therapeutic virtues reported for the seeds of Trigonella spp. comprise carminative, expectorant, aphrodisiac, anti-cancer, anti-microbial, hepatoprotective, anti-inflammatory and anti-lithigenic activities [37–39]. The seeds of T. corniculata are used as condiment in Indian subcontinent and have not been discovered much. Furthermore, Semalty et al. reported that the seed extract of T. corniculata is a better scavenger of free radicals than T. foenum-graecum. The second plant of the same group i.e. T. cordifolia has also been found to be more conspicuous in lipid peroxidation assay with lowest IC50 value of 163.79 μg/ml. The stem extract effectively scavenged the peroxyl radicals. The scavenging potential might be attributed to its ability of donating hydrogen atom to radicals, preventing lipid peroxidation. T. cordifolia, reservoir of pharmacological properties, has been depicted to exhibit immunomodulatory, anti-diabetic, antioxidant, adaptogenic, hepatoprotective, and anti-tumor potential . T. corniculata L. and T. cordifolia (Willd.) Miers might have served as active stimulator herbs in the multi-herbal combination and enhanced the synergistic efficacy of the prepared combination. 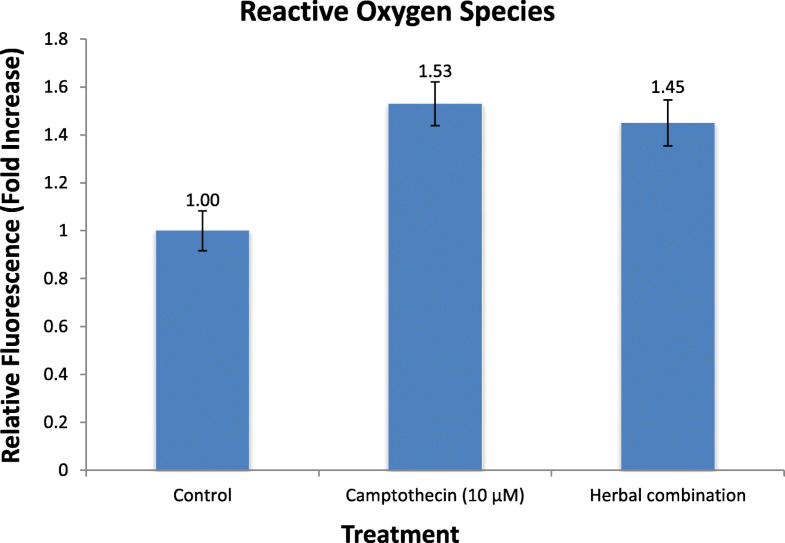 In this study, all of the five herbal samples exerted effective antioxidant power as the IC50 values were observed to be below concentration of 1000 μg/ml in different in vitro assays. This could be credited to the strong synchrony between structure of polyphenolic compounds and their electron or hydrogen donating ability. The effective antioxidant ability of five herbal green extracts against free radical induced oxidative stress might be due to the vicinal substitution of hydroxyl groups on catechol moiety, conjugation of 2,3- double bond to a 4-oxo functionality and existence of 3- and 5-hydroxyl groups on chroman ring of polyphenols . The findings of the present investigation could be further step towards the green approach for extraction and understanding the comparative antioxidant potency. Moreover, the study proposes to offer key reference and provides groundwork for choosing the most apposite herbal samples. Hence, it is reasonable to suggest that the beneficial effects could be exploited better in a judiciously selected combination of the five selected herbal samples and could replace the synthetic antioxidants. Moreover, the combination of multiple components has been recognized as potentially better approach in treatment and prevention of cancers as compared to the single agent . Further, the applicability of PCA may also provide a useful information regarding determination of plant groups to be exploited in a relevant manner to prepare specifically precise multi-herbal formulations in pharmaceutical industries. Thus, with the aim to scrutinize the combinatorial antiproliferative efficiency of these plants and to substantiate their beneficial outcome, a multi-herbal combination was prepared on the basis of grouping in PCA. The prepared combination displayed high synergism in each antioxidant assay showing excellent antioxidant efficacy as compared to single herbs. At the highest concentration of 1000 μg/ml the combination showed highest antioxidant activity of 99.18% in CAP-e assay. The prepared combination was investigated for its antiproliferative potential against a panel of five human cancer cell lines MG-63, A-549, HeLa, HepG2 and IMR-32. Based on the IC50, combination exhibited the most potent growth inhibitory activity against HepG2 cells in resazurin cell viability assay. In present study, combination has been observed to kill the hepatoma cells. The results indicate that this is mediated through the apopotic pathway. The combination generated reactive oxygen species (ROS) in HepG2 cells and consequently led to the dissipation of mitochondrial membrane potential (MMP). The collapse in MMP may indicate apoptotic initiation in the hepatoma cells assisting release of cytochrome c. It may seem contradictory that herbal combination scavenged ROS in antioxidant assays in vitro whereas, its effect in HepG2 cells revealed ROS generation. However, the in vitro antioxidative potential of polyphenols via radical scavenging activity has been scientifically conceived as non-specific method . Thus, radical scavenging effect cannot be extrapolated to anticancer effects. The polyphenols may exhibit differential therapeutic activeness in normal and cancer cells. Moreover, many ROS specifically functions as secondary messengers facilitating many events via ROS-driven cellular signalling in promoting and suppressing carcinogenesis . The polyphenols are pleiotropic compounds as they act additively or synergistically through multiple targets against cancer cells . Thus, generation of reactive oxygen species in cancer cells can be direct outcome of intracellular signalling for apoptotic induction in HepG2 cells. To support this result, herbal combination treated HepG2 cells were analyzed for morphological changes by phase contrast and nuclear alterations by confocal microscopy. The peculiar morphological changes introduced in human HepG2 cells by combination include rounding of cells, shrinkage of cytoplasmic membrane, membrane blebbing, apoptotic bodies and loss of contact with neighboring cells. These alterations displayed a good correlation with the fluorescent nuclear dye i.e. DAPI (4′,6-diamidino-2-phenylindole) staining. As deducible from confocal images, the treatment of combination augmented permeability of human hepatoma cells to DAPI dye demonstrating the presence of nuclear apoptotic bodies and chromatin condensation signifying apoptotic death of cancer cells. Also, the combination displayed extremely high IC50 value towards 293 T cells indicating probable non-toxic nature towards normal cells. This could represent the selectivity of multi-herbal combination for cancer cells and specifies that it would not target normal cells. In this instance polyphenols might have induced the apoptosis in HepG2 cells via multiple mechanisms. The inhibition of proteasome, mitochondrial function disruption, downregulation of MAPK, NF-κB and AP1 activation might be cause of apoptotic induction in one approach while, the upregulation of proapoptotic Bcl-2 family members and caspases with downregulation of Bcl-2, Bcl-xL and survivin might be other mechanism . Generally, antioxidants are cytoprotective but in present study the antioxidant polyphenols inhibited growth of cancer cells. However, there are studies highlighting that polyphenols may not affect the normal cells but can facilitate apoptosis in cancer cells via differential pleiotropic modulatory effects on cell cycle regulation [45, 46], which might be a probable case in the current study. The disruption of mitochondrial membrane potential (MMP) causing permeability transition which leads to release of caspases might have induced the apoptosis in HepG2 cells in present study. As far as we know, the present study offers recognition of potentially new anti-hepatocarcinoma multi-herbal formulation with the combination of Punica granatum L. (peel), Putranjiva roxburghii Wall. (leaves), Swertia chirata Buch.-Ham. (whole herb), Tinospora cordifolia (Willd.) Miers (stem) and Trigonella corniculata L. (seed). This might be answerable to the contribution of mutual synergistic action of polyphenolic compounds as detected by HPLC analysis and presence of other bioactive constituents. The results with HepG2 cells provided the vital information for potentially new anti-hepatocarcinoma multi-herbal formulation. However, the two-dimensional (2D) planar HepG2 cell cultures may offer inconsistent outcomes due to disparity to primary hepatocytes . Based on the observations of our study, it is anticipated that the combination may serve as a prospective multi-herbal formula for deeper research in in vivo hepatoprotective studies to verify its practical use. The present study uncovered the applicability of PCA in construing the antioxidant superiority of water extracted P. granatum L. and P. roxburghii Wall. as compared to that of S. chirata Buch.-Ham., T. cordifolia (Willd.) Miers and T. corniculata L. P. granatum and P. roxburghii were identified as primary or leading herbs, S. chirata as a nourisher herb and T. cordifolia and T. corniculata as stimulator herbs in prepared multi-herbal combination. Conclusively, the PCA can be utilized for reducing the multidimensional characteristics of medicinal plants into separate groups for development of polyherbal combinations. Further, on the basis of principal component analysis, the prepared multi-herbal combination showed best antiproliferative activity against HepG2 cells. Reactive oxygen species generation with decrease in mitochondrial membrane potential and microscopic studies revealed the probable apoptotic induction in HepG2 cells. The activity might be correlated to the mutual synergistic action of the polyphenolic compounds and the presence of other bioactive constituents in combination. Thus, this combination may serve as a prospective multi-herbal formula for deeper research in in vivo hepatoprotective studies to verify its practical use in future. The authors duly acknowledge the financial assistance granted by the University Grants Commission (UGC), New Delhi for instrumentation facility under UGC CPEPA and UPE program. The authors are thankful to Mr. Viney and Mr. Sanjeev Kumar Kataria, HHRC Pvt. Ltd., Amritsar (Punjab) for helping in procurement and authentication of plant materials. The authors gratefully acknowledge Dr. Harpreet Singh Bhatia, CEO, Herbal Organic Agro Pharma (HOAP) Industries, Ludhiana (Punjab) for helping and providing the necessary facilities for the preparation of herbal extracts. The present study was supported by University Grants Commission (UGC), New Delhi under the Maulana Azad National Fellowship scheme to the first author (vide grant no. 201213-MANF-2012-13-SIK-PUN-16650). The additional datasets used and/or analyzed during the current study are available from the corresponding author on reasonable request. PK performed the experimentations and was a major contributor in designing and writing the manuscript. R performed the HPLC-PDA analysis of plant samples and helped in writing the manuscript. RGM interpreted the data and contributed significantly in writing the manuscript. BS and SA provided the laboratory facility and helped in the designing of experimental procedures and data interpretations. All authors read and approved the final manuscript. The present study did not involve any human and animal subjects. In order to carry out non-invasive procedures (assays employed routinely in the laboratory), blood from healthy donors was collected (not more than 2 ml/donor/week) with due permission from Dr. Sunil Kumar Gupta, In-charge, Health Centre, Guru Nanak Dev University (Ref. No.- 1298/Bot. & Env. Sc.) and written consent was obtained from volunteers to participate.